This classic candy is a testament to the talent of thrifty cooks who could craft sweet treats out of the inexpensive items that were readily available in most kitchens. Unseasoned mashed potatoes are thickened to the consistency of modeling clay with powdered sugar, then rolled into a thin rectangle. 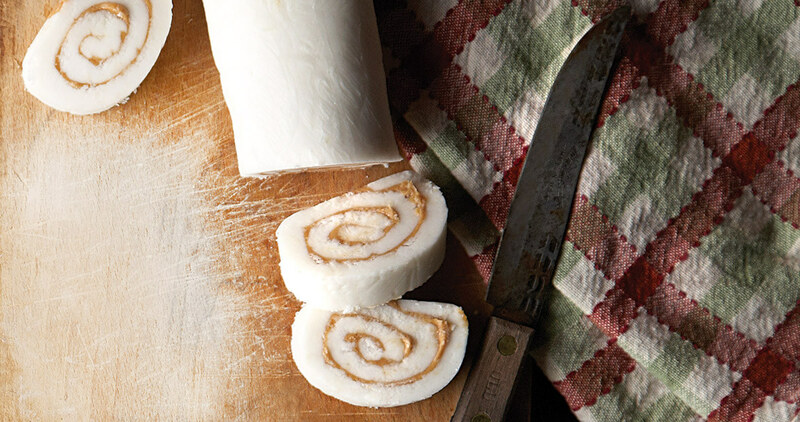 The surface is spread with peanut butter, rolled into a log, and cut into pinwheels. The secret ingredient is a guaranteed conversation starter. 1. Peel and dice the potato. Simmer in a saucepan of lightly salted water until tender, about 15 minutes. Drain well. In a large bowl, mash with a fork or potato masher until smooth. Measure out ⅓ cup of the potato puree. Discard the rest or save for another use. Set the puree aside to cool to room temperature. to medium speed until very smooth, about 2 minutes. 3. Beat in 6 cups of the powdered sugar, 1 cup at a time, to form dough the consistency of modeling clay. If the dough is too soft, continue beating in powdered sugar, 1 tablespoon at a time. Gather the dough into a ball and dust with powdered sugar. 4. Dust a large sheet of parchment paper with powdered sugar. Roll the dough into a 10-by-12-inch rectangle about ⅛ inch thick. Trim the edges to make them straight. Generously sprinkle powdered sugar over the dough. Place a second sheet of parchment paper over the dough. Flip over the dough and discard the sheet of parchment that’s now on top. 5. Spread the peanut butter evenly over the dough. Starting at one long side, tightly roll up the dough (jelly-roll style), using the parchment paper as a guide. Wrap the roll in the parchment paper and freeze for 1 hour. 6. Using a sharp knife and a gentle sawing motion to avoid crushing or flattening the roll, cut it into ¼-inch-thick slices. Store the candy in an airtight container in the refrigerator for up to one week.